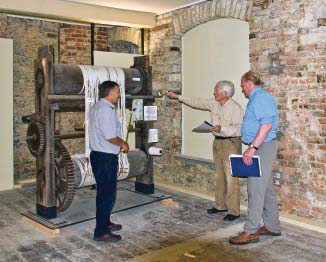 Our long-term objective is to create a Heritage Centre that represents the complete history of Axminster, of which the carpet industry has been a leading factor. The ground floor will house the major attraction: a unique national collection of 18th century Axminster carpets, with the objective of retaining them in the UK rather than them being sold overseas. In addition there will be some interactive displays. We also plan to have a children’s area showing how to create a carpet, with hands-on spinning and dyeing opportunities and tactile, sound and smell features. The ground floor might also house a gift shop and the nearby Tourist Information Centre. On the first floor we will devote areas to non-carpet-related items that have played an important role in the history of Axminster. A cafeteria is also proposed, together with a conference area that can double as a classroom for school visits. The upper floor will become a reference centre and computer design room, where students can browse early documents and written works on Axminster carpets. They will be able to design their own carpet patterns. Longer term it is planned to develop visual links to the current factory so visitors can see old and modern carpet- weaving techniques. We want the proposed Heritage Centre to appeal to all: young and old, residents and visitors, able bodied and not so able bodied. For every visitor it should be an exciting experience. Check out our Project Aims.